I bought my house a little over 2.5 years ago. It was right before the crazy value increases of the Dutch house market. I sold my old house without a real estate agent and had only a few months to find something new that matched my wishes. One of the buildings I had in mind was the St Jobsveem warehouse in Rotterdam west (Lloydkwartier). This building was realized in 1912, survived the bombing during the war and is now a monumental building. In the early days the St Jobsveem building served to store and distribute colonial products under customs supervision, during the World War it was used as a weapon storage, in the ‘00’s as an infamous nightclub and in 2005-2007 the building was completely renovated and made into 99 luxurious loft apartments and 10 penthouses. As I said, I really wanted to live in this building that’s known for it’s cast iron columns and hard wood ceilings. So you can imagine my excitement when I heard I made the best offer to the apartment that was thus far rented out. Everyone that has ever been in my house knows I did not like the kitchen. At all. But since I bought the loft on my own, and buying a house comes with moving, notaries, new furniture and many trips to the hardware store I had to be smart. You can only spend your bucks once right? So 2.5 years ago I decided to wait with the kitchen until I saved up some more and knew exactly what I wanted. I focused on other projects as my bed platform and interior decorating. (the photo above shows the house in the early stages when the interior wasn’t done by far). See that bike, punching bag, Barcelona chair and mirror? All gone! But the day is here: I’ve redone the kitchen! On the left you see the old kitchen. I was a pretty standard thing with white tiles, white wood and a black countertop. The whole things just looked way too crowded and basic. Also, I’m not a fan of those big extractor hoods and chrome handles. What I did is collecting a lot of inspiration. I made a Pinterest board and looked around in shops. This way you can narrow your wishlist more and more. In the end I had one starting point: a countertop in marble. First I had to find a place to shop. Over the last year I’ve visited at least 10 different kitchen stores in different price categories. In my opinion most of them are the exact same. Especially the discount stores are everything I dislike about re-doing the kitchen. Slick salesmen, non-transparent prices and a lot of people without a vision. The search for a good partner really took some time. In the end I ended up at a store 20 minutes outside the city. The reasons I opted for this kitchen store were 1) great reviews (check them! ), 2) transparant prices (no bargaining), 3) the brands they worked with, 4) the fact that they have all departments in-house (from sales, to finance, to the guys installing the kitchen, to aftersales) and 5) the quality and style of the kitchens in the showroom. Really take your time to find a place you feel comfortable and don’t let anyone rush you into buying your dream kitchen. Also remember that you will visit the store several times, so don’t pick one too far for your home. In total I went to the store 5 times, this would have been a timely disaster if I would have picked one in a different region. It all starts with your ideas. The first conversation with your kitchen partner really goes a lot more smooth if you’re well prepared. Show your Pinterest board, bring some samples of colors or textures, list things you’d really want, list the things you don’t want. Know your budget (you’re not obliged to tell anyone but it can make the process a little easier when they know your price range) and bring the measurements of the space. There are a million questions you can ask yourself. Would you like a kitchen island? Induction, ceramics or gas? Do you like overhead cabinets? What’s more important to you: aesthetics or the practical use of materials? Have you thought about the kitchen appliances? And so many, many, many more. I can be very blunt about this. You can make your kitchen as expensive as you’d like. You can keep the old structure and redo it with some simple changes. Such as upgrading with some new and pretty handles, other cabinet fronts, a new color on the wall and or only opting for a new counter top. What’s also very popular is using a very affordable IKEA kitchen as the skeleton for your kitchen and make it more your style with partners who upgrade IKEA kitchens. There’s a huge market of companies that make (concrete) countertops or wooden cabinets for just IKEA. It’s something I looked into as well, but in the end decided to take another route. Honestly, I kind of love the simpleness of some of their designs. If you’re very handy yourself this is a great option. When you let IKEA install your kitchen, it’s getting less of an affordable option. Just something to keep in mind. Back to money. How much does a kitchen cost? Well, there’s no right answer. Somewhere between 5,000 and 50,000 euro. But that’s not helpful at all, is it? It’s the same when buying a car. You can buy a second hand Fiat Panda or a brand new Tesla. They both bring you from A to B. So first of all think of what you would be willing to spend. There’re many guidelines of the costs a kitchen. From budget (5k) to average (10-15k) to high-end (25-35k). Another thing to keep in mind is the rest of your house. It might not be advisable to install an expensive kitchen in your short-term rental. Some salesmen would say a kitchen can cost up to 10% of the worth of your house. I don’t know if that helps you at all, but it’s just another way to look at things. What I did is first create my dream kitchen and from there see where I could chose budget options over nice to have’s. I opted for cheaper kitchen appliances (oven, hot plate) and did not get a Cooker faucet. I also made decisions that didn’t come cheap but really made the kitchen for me. Such as the counter top by SileStone, the golden faucet and sink by Lanesto and the extraction lamp by Airo Design. In the end the total price of the kitchen was still a big expense for me, but one I really felt good about. You can choose to save up for your kitchen renovation or talk to the bank. There might be a construction depot or credit depot available within your mortgage (sometimes even without the visit of a notary). 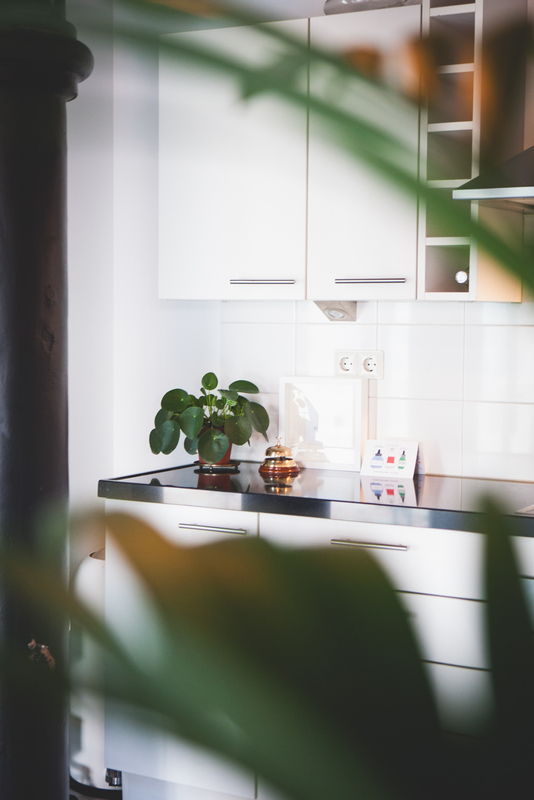 When you’re done redoing your kitchen don’t forget to update your home insurance and it might also be wise to bring someone in for a house taxation. The increase of value might even get you an interest rate reduction on your mortgage. Are you curious about the end result? Stay tuned, in January I can show you the result with all ins & outs about my brand new kitchen.